Even though the Feiyu G5 gimbal is now available on the market, its old version, the stabilizer which is today the subject of our Feiyu G4S review is by far not obsolete now. 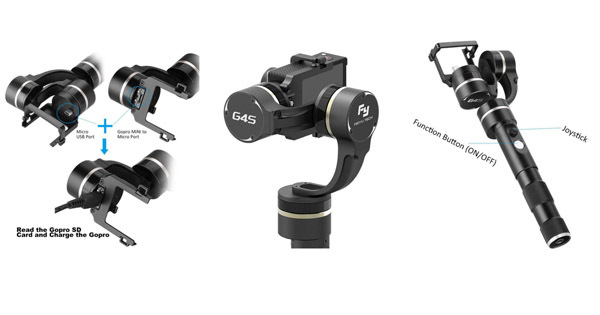 As we’ll see you during this Feiyu G4S review, these 2 Gopro gimbals answer to totally different needs. The main reason for which the Chinese gimbal manufacturer decided to produce the G5 was the incompatibility of the old version with the Gopro Hero 5 Black. Without wasting any second, discover our in-depth Feiyu G4S review in which we’ll look into every relevant criterion you really should know about this Gopro gimbal. Let’s start this Feiyu G4S review, as we are used to, with the battery life of this Gopro gimbal stabilizer. As very often with this manufacturer, the battery is really good. You can count on between 3 and 5 hours of battery life according to the use you’ll have. It’s less than the G5, but it’s more than acceptable and we can only give a good point for this in our Feiyu G4S review. Despite its 2 quite small 900mAh batteries, the battery life of the subject of our Feiyu G4S review will certainly please every of its users. Additionally, note that like on the G5, the Zhiyun Evolution, the Ikan Fly X3 Go or the EVO GP PRO, you’ll be able to recharge your Gopro while in use. For this, you’ll only have to connect your camera to the micro USB port which is fixed on one of the motors. This is very useful and we truly enjoyed it during our Feiyu G4S review. Contrary to the 4 other gimbals we have just quoted, you don’t need any cable here. It’s therefore way more useful and convenient according to us. We will come back more precisely on this point later in this Feiyu G4S review. Meanwhile, we can only enjoy this Gopro gimbal for its good autonomy and the fact that you can recharge your Gopro while in use without any cable. Even though it’s almost 2 years old, this is still one of the many references on the market when you want to buy a Gopro stabilizer. Even though it’s quite old, the manufacturer already did a very amazing job 2 years ago. In the end, we graded it with a 9.5/10 in this category of our Feiyu G4S review. For the time being, only a few gimbals can boast such a good battery which is able to recharge your Gopro. In the next section of this Feiyu G4S review, we’ll look into the quality and reliability of this gimbal. 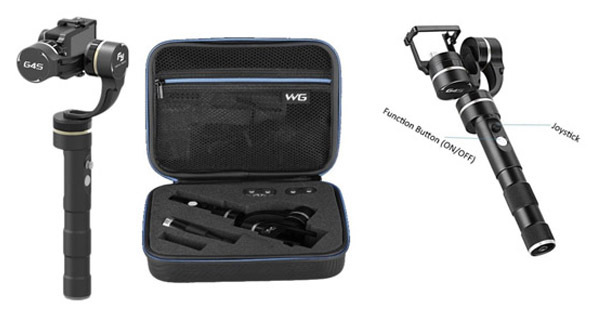 Second criterion of our Feiyu G4S review, the quality and reliability of the Gopro stabilizer. One more time, we weren’t disappointed as the quality really convinced us. As we already said in this Feiyu G4S review, this gimbal is far from having been overtaken by the G5 gimbal. 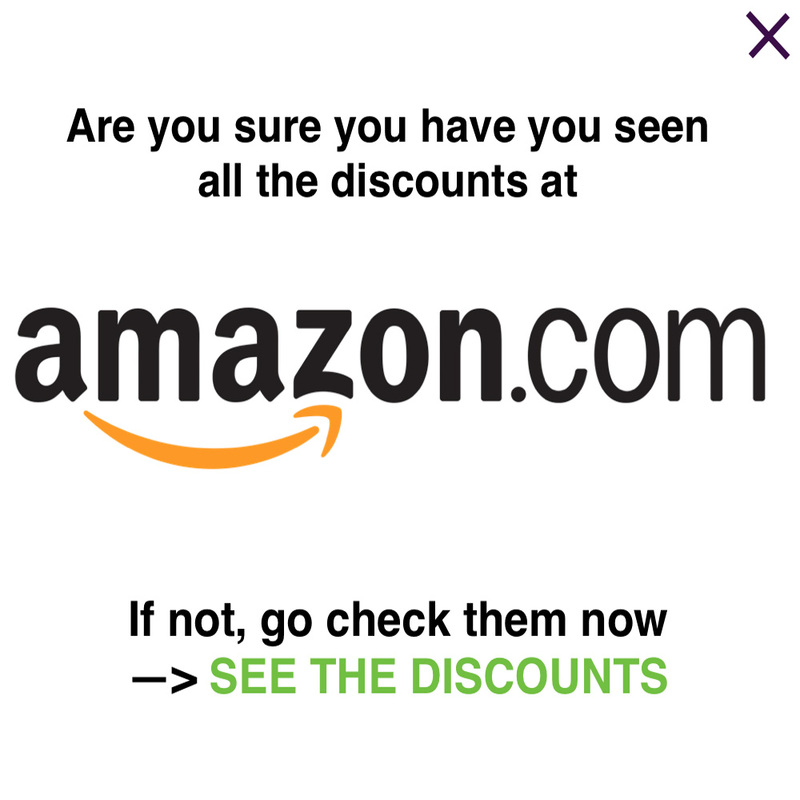 Indeed, even though it’s getting a bit old, it’s still a product which is very frequently sold. You can find it very often in sportive areas where its 3 360° axis really please its users for the freedom it offers for the shots. During our Feiyu G4S review, we could only enjoy this characteristic. Thanks to its very robust grip and its many assets, this gimbal is still widely sold around the world, and, according to us, it’s not about to stop (particularly thanks to the constant decrease in price). The quality and reliability of the motors is also very good and the motors are definitely among the most reliable on the market. We’ve bought ours almost 2 years ago and we are still using it very often, even though we have plenty of other gimbals. Each time we use this one, and, particularly during our Feiyu G4S review, we feel like we are using a perfectly new and never used gimbal. The only little weakness we could find for this gimbal is the 5-way joystick button which looks a bit like a low cost gadget. But, as you can guess, this was only an impression and the quality was truly there. It’s not at random if we graded it with a 9.2/10 in our Feiyu G4S review. In fact, despite the few impacts it met during its life, everything is still working perfectly for our greatest happiness. The time when the Chinese products were bad quality ones is really a thing of the past. Now, the main players on the market are mainly Chinese, as, for instance, Feiyu, of course, but also Zhiyun, Snoppa, or DJI (for smartphone and cameras). Just below, discover our third section of our Feiyu G4S review which will be about the quality of the stabilization. With a grade of 8/10 in our Feiyu G4S review, this Gopro gimbal stabilizer is not the best you’ll find on the market as long as the quality of the stabilization is concerned. Of course, the 3 brushless motors do a very good job and will significantly improve the quality of your videos, but it’s not the best one. And, as you know, we are not only here to say “this stabilizer is good, or bad” but also to compare with others in order to help you find the best Gopro stabilizer. The main reason which can explain the relative low grade in this Feiyu G4S review is the fact that it was one of the first. Therefore, the motors were not as good back then than they are now. Still, the outcome is very impressive when you know that this gimbal is 2 years old a gimbal. Since, the algorithms have been improved to be even more accurate. What we really enjoyed during our Feiyu G4S review, though, was the 3 axis with perfect 360° rotation. Be it on the Pan, Pitch or Roll axis, you’ll be able to do a 360° without having your camera hit the structure of your gimbal. Believe us, this is very pleasant. It’s even more pleasant when you compare with other gimbals with which you are often stuck because your motors do not offer 360° rotation on all axis. It’s strange, but, even the G5 gimbal doesn’t offer a 3 360° rotation… We were a bit surprised during our review to see that the roll was only on 245°. Unfortunately, our Gopro happened to touch the structure quite often because of that. In the end, no matter the moves you do, the product of our Feiyu G4S review will never cause you any trouble. The use is therefore very pleasant, as you’ll see later in this Feiyu G4S review. In the end, you’ll be able to shoot videos in every direction, by doing anything you want, without ever being stuck. The stabilization will always be guaranteed by the 3 axis brushless motors, and, even though it’s not the best you’ll find, you’re bound to be very satisfied with this gimbal. If you really want the BEST stabilization, you can have a look at the Removu S1, the Gopro Karma Grip or the EVO GP PRO Gopro gimbals. In the next section of this Feiyu G4S review, we will present the functions of this stabilizer. 4th criterion of our Feiyu G4S review, the different functions you’ll find with this Gopro gimbal stabilizer. Actually, you might be a bit frustrated by the lack of functions with this gimbal. At least, we were during our Feiyu G4S review. As a matter of fact, as far as versatility is concerned, only the Gopro Hero 3 and 4 will be compatible with this gimbal. This is the very reason for which its manufacturer decided to produce a new gimbal, the G5 in order to have a solution for the Hero 5 Black. But, as we said earlier in this Feiyu G4S review, this gimbal offers quite a few other surprises despite its years of service. The first thing we truly enjoyed with this Gopro stabilizer and that we already mentioned during this Feiyu G4S review, is the fact that you’ll be able to connect your Gopro to the micro USB port in order to recharge it. FeiyuTech is the only manufacturer which offers this function and we truly thank him for that. In fact, all the other competitors that enable you to recharge your Gopro do it with a cable…and this is not always very convenient. Here, you’ll just have to plug your Gopro to the USB port and the job is done, your Gopro won’t lose any of its battery. Our grade in this section of our Feiyu G4S review is 8.7/10 is mainly due to this very pleasant solution. The second quite interesting function that you’ll have with this gimbal is the fact that, if you connect your Gopro to your gimbal, you’ll be able to watch what you are shooting. For this, you can connect your phone or tablet to your gimbal via the 3.5mm AV Out. This will enable you to have a live feed of what your Gopro is shooting. Even though this function is not the most interesting we’ve seen during our Feiyu G4S review, it can end up being very useful in some specific situations. Of course, we truly don’t think that this will be convenient if you use it for action sports, for instance. The other option you have is by using the Gopro app on your phone, but, in our experience, this works 50% of the time… The third option is to have the Gopro Silver with the screen backpack. Unfortunately, we did not have this camera for our Feiyu G4S review. As far as the modes are concerned, we will have the occasion to have a closer look to them during the next section of our Feiyu G4S review which will be about the taking in hand and controlling. As you can see in the video above, this Gopro gimbal offers 3 (or 4) different modes to stabilize your Gopro in order to adapt to every situation you could ever meet. A fourth mode is also available and will be useful if you want to shoot upside down videos. We tried it during our Feiyu G4S review and we truly have to admit that it gives a very original result thanks to the shots which are very close to the ground. Our Feiyu G4S review is now about the taking in hand and controlling of your Gopro gimbal. When you want to have a sportive use of your stabilizer, it is quite important, according to us, to have a good grip and, this is equivalent to a good taking in hand. With a weight of 0,6lbs/270g, this gimbal is really impressive and the taking in hand is therefore very pleasant. The only thing that could be improved, one more time, is the length of the grip, which is, slightly too short, as we very frequently say in our reviews. Still, thanks to its 1/4″ screw opening under your grip, you’ll easily add a telescopic extension for less than 25$. With this equipment, you won’t have any trouble during your shots and the size of the grip will be perfect for a good grip. Like very often, we added an extension during our Feiyu G4S review in order to make better shots. We can only advise you to add one if you have the occasion, it will make the stabilization even better. With a grade of 9/10 in our Feiyu G4S review, this Gopro stabilizer which offers 3 360° axis really managed to convince us during our test as far as its controlling is concerned. In fact, before everything, the grip to fix the Gopro is very convenient. Contrary to what many competitors offer, the G4S has a clipping fixation system. You won’t have to screw anything there, as it’s the case, for instance, with the EVO GP Pro, the Zhiyun Evolution or the Feiyu G5. This is something we truly enjoyed during our Feiyu G4S review. Indeed, fixing your Gopro to your gimbal will take you what… 5 seconds maybe ? Even though you didn’t have to screw anything, you have no reason to be scared about the quality of the fixation. Indeed, the clip holds very well and, despite our very sportive use for this Feiyu G4S review, our Gopro didn’t move at all. In the end, you win a significant time each time you want to fix your Gopro on your gimbal. As far as the controlling is concerned, we had a little regret during our Feiyu G4S review. Indeed, there is no mobile application to remotely control your gimbal. Yet, we can understand that when we know this stabilizer is 2 years old… At that time, the priority was not about having a good mobile application but only a good gimbal with good stabilization. What we really enjoyed, though, was the very good reactivity of the subject of our Feiyu G4S review. In fact, the motors react very fast and enable you to follow your target easily, even if he is very active. This criterion is very important according to us and we didn’t have the same good feeling with all the stabilizers we have tested. Some have very good stabilizers, but the reactivity is kind of bad. For a comparison, the G5, which is the latter gimbal of this manufacturer, has a very good stabilization but the reactivity disappointed us a little. In this Feiyu G4S review, we could only be pleased by the perfect speed of the motors which offers both a stabilized and very smooth image. 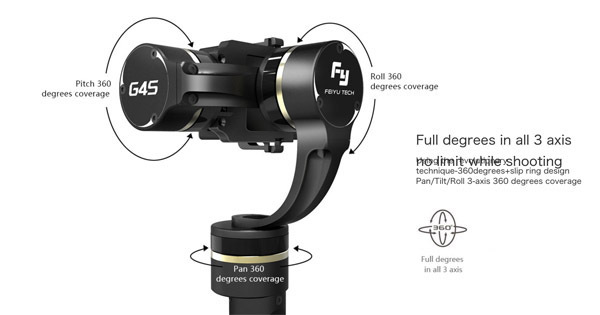 As we’ve already seen above in this Feiyu G4S review, there are 4 modes that you’ll be able to use with this gimbal. Thanks to that, you’ll be ready for every situation you may face. The basic mode will keep the horizon steady. The second unlocks all axis in order to do perfect follows. The third sticks to one direction and the motors will compensate in order not to lose your target from sight. Finally, the fourth mode is the Upside down mode for very original inverted shots. For more details, we invite you to read our fourth section of this Feiyu G4S review about the functions of the gimbal. Knowing it’s two years old, the price could have been even lower, like 150$ in order for it to get a 10/10 in this section. If it was a brand new one, we would definitely have given it a 10 ! Just below, discover our very short summary in which we go back to the Pros and Cons we saw during this Feiyu G4S review. 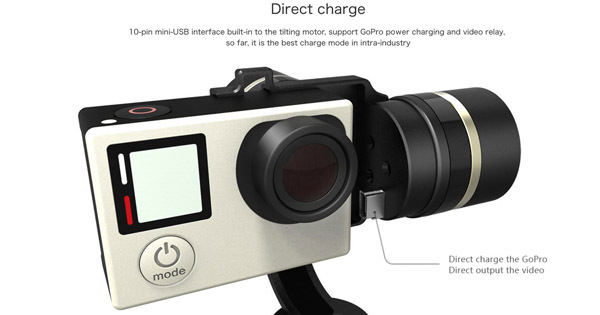 Pros : The price, the very good battery life, the easy controlling, the 3 360° motors, the very good reactivity of the motors, the USB port to recharge the Gopro. Cons : The relative lack of functions, the quality of the stabilization which is slightly behind its competitors, the incompatibility with the Gopro Hero 5 Black. As you’ve seen in this comprehensive Feiyu G4S review, the quite old Gopro gimbal of the famous Chinese manufacturer is really far from being outmoded. With a very good grade of 9/10 in our Feiyu G4S review, it really ranks well in our Gopro gimbal comparison. It’s still (and for a long time) one of the best Gopro stabilizer. The only Gopro Gimbal with 3 360° axis.